As featured in my amazing friend’s the Liberty Mag – https://thelibertymag.wordpress.com/2017/08/25/be-cool-as-a-coconut-raspberry-triple-coconut-loaf-cake/*Do check out the above uni student-run independent online magazine for more fun & inspiring articles about a wide range of topics! This cake is a sensational celebration of one of the most versatile ingredients on Earth, coconut. It’s great in savory as well as sweets dishes, aka my absolute weakness with which you can bribe me into doing anything (okay, that may or may not be an exaggeration but I dare you to try it). 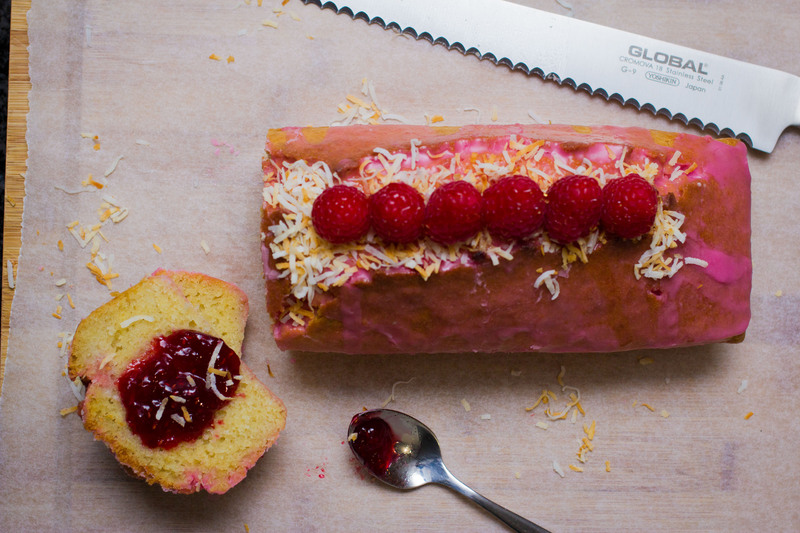 Triple Coconut Raspberry Cake with Lemon Glaze. Why Triple? Well, coconut milk, coconut oil, and desiccated coconut are all in the batter, with an added touch of shredded coconut on top. When you taste this cake, you’re literally embracing the many sides, textures, and tastes of the humble little coconut. In a bowl, sift in and combine well the flour, baking powder, baking soda, and salt. In another bowl, whisk together the coconut oil, sugar, eggs, coconut milk, desiccated coconut, and vanilla until smooth. Remove the cake from the oven and let it cool in the pan on a wire rack for at least 10 minutes. When the cake is cool enough to handle, remove it from the pan and let it continue to cool on the wire rack before making the glaze; this will take about 30 mins. In a small bowl, combine lemon juice and icing sugar. Add 1-2 drops of rose pink coloring, or until the glaze’s colour is to your liking. Pour the glaze over your cake and let it set completely. Note: Feel free to top the cake with fresh raspberry, honey, and shredded coconut and eat it with raspberry jam (or other jam that you have in hand) just like I did. It’s amazing!